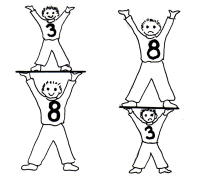 I always love using pictures to illustrate a difficult concept in math. My third grade students often had a hard time remembering the difference between a proper and improper fraction. At least until I got the bright idea to turn it into a visual. We talked about whether it was proper (or right) for a small child to have to hold a very large child. The students agreed that was improper or not the right thing to do. When we drew the proper fraction illustration, it made sense that this was the proper or right way. Students love to ham it up, so have them exaggerate the sizes of the boys. Information that has been exaggerated is much easier to remember. By adding numbers, the connection is made between the math term and the procedure. Make sure students label each drawing as an improper fraction or proper fraction. Remember, 65% of our classroom students are visual learners who struggle with math. Give them pictures to hang on to. Math vocabulary is not easy for 7 or 8 year old students to remember. When students are asked to find “equivalent fractions”, their eyes glaze over and expressions go blank. Give them a way for remembering the meaning. The word “equivalent” is long and difficult but by looking at the beginning syllable, they see a part of a familiar term, “equal”. Draw the = sign and write the first part of the word, “equ”. Soon a connection between the word and the meaning is made. Be creative and use pictures to help kids remember.